What’s Nairobi life like? The keywords are: cosmopolitan, sight-seeing, shopping, culture, bars and restaurants, night life. Read all about it here. Nairobi is a huge city with officially 2 million, but in reality probably between 3 and 4 million inhabitants. Over 4 decades after independence, the city still has a distinct British atmosphere – from the old-fashioned shop signs, the buses, and the way people behave and talk. Even their conservative dress and politeness remind of the British, as well as their love of tea. This is combined with the relaxed, easy-going nature of Kenyans, who always have time for you and who like to help strangers out. Nairobi is a cosmopolitan place where you’ll meet all kinds of people. Even more so as many artists, writers and other cultural and intellectual people fled from other parts in Africa to Kenya’s capital, which has always been more stable than many other African countries. 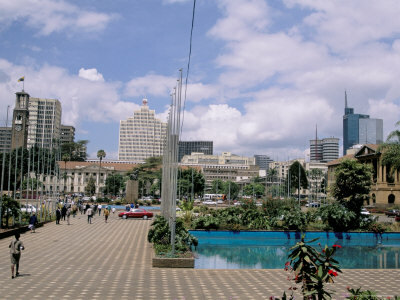 Nairobi has a reputation of being criminal and most tourists only use it as a hub for safari and beach trips. But I think that’s selling the city short. If you keep some simply rules, nothing unpleasant is likely to happen to you in Nairobi, and the city has a lot going for itself: some great sights including Nairobi National Park, a lively cultural scene, great restaurants and pubs, an unbridled night life, and some of the best facilities of Africa in terms of infrastructure and health. The most prominent destination in Nairobi is the Nairobi National Park, a full game reserve right outside the city. Though not really part of everyday Nairobi life, it is definitely a major tourist spot. Just like another capital city, you'll find museums, theatres, large sports arenas, movie venues, dance clubs, shopping centers, business areas and more. Find the main Nairobi tourist destinations here. 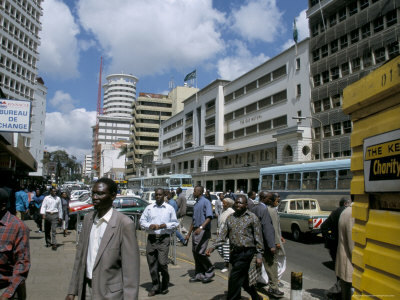 Nairobi is a modern capital city, and Nairobi life is much like it is anywhere else in the world. There’s a university, some of the best newspapers of Africa (especially the Daily Nation), television stations and wide-spread Internet access in cafés and hotels. You'll find plenty of green spaces in Nairobi, with large parks like Central and Uhuru Park right in the center of the city. Restaurants serving cuisine from around the world are popular in Nairobi. Though many do specialize in local Kenyan dishes, you can also find Italian, Indian, French, Japanese and many other restaurants around the city. Carnivore is a particularly well-known Nairobi restaurant, that serves meat roasted over an open charcoal pit. It’s touristy, but don’t miss it. My other favourite Nairobi restaurants include Simmers, Pasara Café (a café-brasserie which is open until 6 PM) and Tropez. For some fabulous nightlife, go to the New Florida club. It’s in a saucer-shaped building above a petrol station, and rightly nicknamed Madhouse. With such a rich history of English settlers in the area, there are a number of very affluent housing areas in Nairobi. Suburbs with English names and large western style homes are fairly common in the west part of the city. Expats live in the suburbs of Karen and Langata. On the other end of the spectrum, the city is surrounded by slums like Kibera and Mathare where about half of the city population live. It’s only safe to go there with a guide who knows his way, and be prepared for some shocks if you do. Getting around the city of Nairobi fairly straightforward, with the most common form of public transportation being taxis, and private minibuses called matatus. A matatu is sort of like a combination of public bus, taxi and private vehicle. Something like a shuttle bus, I suppose. They follow loose routes and schedules, usually operating between 2 set destinations. Though matatus in Nairobi have had a colourful and reckless reputation in the past, they are much more closely regulated now. There are also regular taxis that you can hail for your own transit. All in all, Nairobi life is colourful, laid back, and has something to offer to anyone.